Join host Robert Forto as he welcomes Bailey Vitello and Brainna Blomgren to Mushing Radio. Bailey and Brainna own and operate Northern Exposure Outfitters Dog Sledding Company in Massachusetts. They not only run races but provide educational opportunities for people that are interested in dog mushing as well as selling mushing supplies all over North America. Bailey Cross Vitello was born into the sport and has competed in mushing competitions throughout his life. His love for his dogs and commitment to his team has made him a very successful musher and dog sledding teacher. Some of the races he has competed in include the Junior Iditarod (winning the half way point), Pedigree Stage Stop, Laconia World Championship, Race to the Sky (winning best cared for team), Can Am 30/60/250 (the youngest competitor for each of the three races, winning the Can Am 30 in 2015. He most recently competed on team USA for the 2017 Winter Sled Dog World Championship and won Bronze. Having experienced the responsibilities of caring for his dogs and surviving in the wilderness with his team, he is the perfect person to work with students and those looking to learn to help them understand the mushing sport, equipment used and all about his team mates (the dogs). 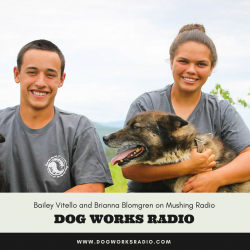 Brianna Blomgren was introduced into the dog sledding world about six years ago when she met Bailey. After a short time, she became enamored with the sport and has been competing, training, and teaching ever since. Her love and passion for the dogs is evident from her meticulous care for them. Brianna is responsible for most of what goes on behind the scenes when it comes to the family business Northern Exposure Outfitters Dog Sledding Company. From setting up educational programs to lessons and tours she is the person that will help to make your dog sledding dreams come true!